This Dog Wash Fundraiser is for the Abbotsford BC SPCA Paws for a Cause volunteer team, the Abby Animal Adorers. A wonderful cause...Bring your pooches down! The volunteers will be on-hand to wash and dry your dogs! Great way to keep them cool! Beautiful Dog Wash & drying stations! Donations start at $9.99 and you don't need a dog to donate. The team is comprised of volunteers from the Abbotsford shelter. All money raised for Paws for a Cause goes directly to the Abbotsford BC SPCA to support their work serving sick, neglected, abused and homeless animals in Abbotsford, Each team raises money through fundraising and personal donations. Below is a link to their page. Canine Costars is at Paw Street once again this Sunday, May 20th. This time its -"ALL SIZED DOGS WITH OUTGOING PERSONALITIES" Don't miss out, the last event was very busy! Is your dog a star? Renowned film animal trainer, Bonnie Judd of Canine CoStars will be at our Abbotsford location on Sunday, May 6th from 1pm-4pm looking for Small Dogs "Under 15lbs" with outgoing personalities. Our Abbotsford location opens Saturday February 17th 2018 after a 2 week delay. Our Dog Wash Station will be open after Feb 20th. We apologize and thank you for your support and patience. Our customers are awesome! Located at "McCallum Junction" in Abbotsford. Just north at McCallum Road & Hwy 1. Hope to see many familiar faces and quite a few new ones. For directions see our contact page. 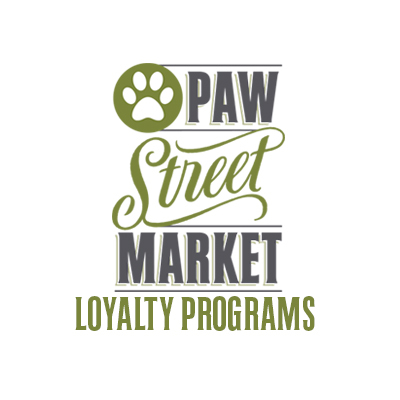 The staff at Paw Street Market would be happy to honour any existing program you may have elsewhere. We look forward to having you as part of the Paw Street family! See staff for more details.